Cauliflower Grilled Cheese Sandwich – You will love this alternative! cook cauliflower according to directions on the bag. combine cauliflower, eggs, parmesan and oregano. Mix until evenly combined then season with salt and pepper. Heat a large nonstick skillet over medium heat. Spray with cooking spray then scoop the cauliflower mixture into a small patty on one side of the pan. Repeat to form a second patty on the other side. Press down on both pieces with a spatula and cook until golden underneath, about 5 minutes. Flip and cook until the other sides are golden, about 3 minutes more. 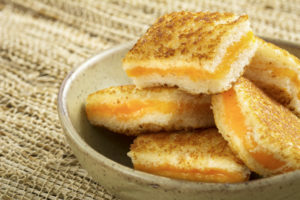 Enjoy the Cauliflower Grilled Cheese Sandwich!